Andrew Zgorliski graduated from Penn Commercial Business/Technical School in July, 2011. He completed the Electrician Program in just three semesters. However, it was not always a clear road for Andrew. He was born in Washington, Pennsylvania and still lives there today. Upon his graduation from Wentworth High School, Andrew immediately started his collegiate career at the California University of Pennsylvania where he majored in electrical engineering technology. However, after two years at California University of Pennsylvania, he began questioning what he could do with the degree he was working towards. He confided in his grandparents, seeking their advice. It was at this time that his grandfather encouraged him to go into the skilled trades. He had worked for one of the steel mills in the area as an electrician and urged Andrew to consider such a rewarding and stable career as well. Andrew took his grandparents’ advice and began to research how to move forward as an electrician. After looking at his options, Andrew chose to transfer to Penn Commercial Business/Technical School in Washington, PA. He was excited about what the curriculum had to offer. He also liked the idea that he could complete the program in just nine months and enter the workforce very quickly. Andrew graduated from the electrician program almost six years ago, yet his admiration for the school and program still holds true. “I liked it because they had a lot of hands-on learning,” Andrew explained. He went on to describe how they have an entire lab set up in the school and how useful this was to learn by doing. Also, Andrew thoroughly enjoyed that the professors worked full-time in the field in addition to teaching. Professors at Penn Commercial Business/Technical School are able to teach precisely what they are actively doing in their own work. They are up to date on the field and can help prepare students to be marketable for current positions. Andrew’s favorite courses were residential wiring and motor controls. “I really liked motor controls because all of the industrial aspects of it. That’s really what my job is right now as we do a lot with motor controls and PLCs’.” Andrew attributes being so prepared in the field to the knowledge of his instructors. 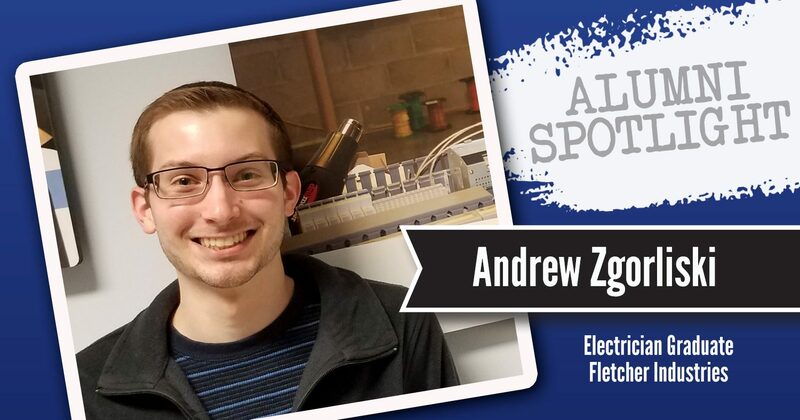 Andrew currently has a rewarding career at Fletcher Industries in Southpointe. His official title is Wireman. Andrew explained how confident and prepared he was for the interview. “In my interview for Fletcher, my boss took me on the workshop floor and I was able to pick out all of the different parts in the control panels just from recognizing them from school.” His education and hard work has absolutely gotten him to where he is now. He loves working there so much that he obtained this position in August of 2011 and has been there ever since. Andrew’s job consists of contract manufacturing for industrial control panels for companies such as US Steel and Corning Glass. Andrew’s most recent work, however, is what made him the most enthusiastic. Andrew has been working with a company called Lawless Industries to build parade floats for Walt Disney and Universal Studios. He has been sent to Florida about five times since November and was also sent to Paris twice to go to Disneyland. While there, it is Andrew’s responsibility to install the panels they have built in the shop. Andrew’s company builds the panel, ships it to the appropriate location, and Andrew installs it on site. Once the panels are installed, Andrew assists in the programming process to get the floats up and running. Aside from his education and working in the field, another important aspect of Andrew’s life is his family. He currently lives with his brother and enjoys spending time with him. He goes to concerts often with his sister and brother-in-law and he looks forward to skiing every winter. His sister is also a recent graduate from Penn Commercial Business/Technical School. She just completed her last semester for the Medical Office Administration program. Very soon after graduation she also landed a fantastic position with Washington Health System. Andrew and his sister both had such a great experiences at Penn Commercial Business/Technical School, that they are now urging their brother to go there.. When asked what advice he would give to his brother, and any other prospective or current student, Andrew replied, “Put all of your effort into it. If you’re going to do it, don’t do it halfway.” Based upon how well he is doing, it is safe to say he’s got the right recipe for success.